On first moving to the UK I remember being amazed by the range of curries available in curry restaurants. I lived in Rochester, in Kent, and at least ten curry restaurants within walking distance of my flats. And every single one had at least one curry I hadn’t heard of before. Having (almost literally) grown up on a diet of rogan josh, vindaloo, butter chicken and raan, curries like jalfrezi, dhansak and phal seemed positively exotic. I put in some hard yards and after serious research I had the distinctions under my belt and could negotiate my way around a menu in my sleep. I’m pretty sure that a doh piaza was something with which I was not conversant before heading to the UK. The key thing with a doh piaza is that it’s all about the onions. Indeed, ‘doh piaza’ means ‘two onions’. As with all curries, a long slow cook is in order, so don’t try to whip this up after work. I made this on Monday for Wednesday night’s dinner. I kept aside the second batch of onions, ready to add (along with the garam masala) as the curry was heating up. This is not a super spicy curry (I ate mine with plenty of hot lime pickle!) and it doesn’t have a scary list of spices so if you’re something of a curry novice, or don’t cook curries often, then this is a great recipe to have in your repertoire. The basis for this recipe comes from Charmaine Solomon’s classic Complete Asian Cookbook and, perhaps less so than usual, I apologise for what is probably an uninspiring photo. But we all know curries are tough to photograph! Heat some oil and ghee in a heavy based pan that has a lid. Finely slice half the onions and cook until golden. Then set aside. While cooking the onions, roughly chop the remaining onions and put in a food processor with the garlic, chopped ginger, yoghurt, chilli, fresh and ground coriander and cumin seeds. Process until smooth. Once the sliced onions have been browned, add the chopped lamb to the pan and brown. You may need to do this in batches. Set the meat aside. Add a little more ghee to the pan and then add the onion and spice mix. Cook, stirring frequently, until it darkens in colour and oil starts to appear at the edges. Be patient. Return the meat to the pan, add the cardamom and stir well. Turn the heat down to low, cover and cook slowly until the lamb is tender. Allow at least a couple of hours. 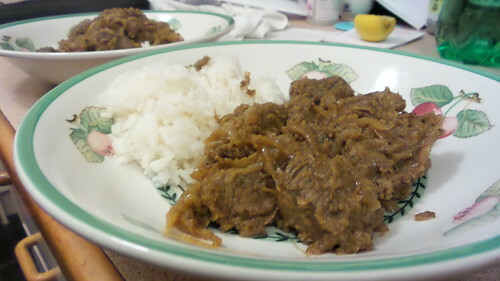 When ready to serve, stir through the sliced fried onions and garam masala. Cook for a further fifteen minutes and then serve with rice (or naan).